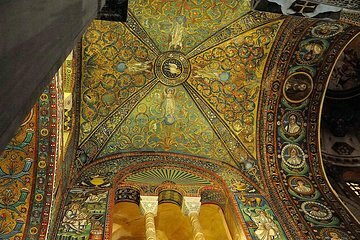 Discover the masterpieces of Ravenna during this in-depth and informative walking tour. You’ll get a comprehensive introduction to the UNESCO-World Heritage site, renowned for its ancient monuments and golden mosaics. Learn where Dante penned his famous Inferno and pay your respects to Italy’s beloved poet with a visit to his 14th-century tomb. Your guide will lead you through scenic town quarters as you’re entertained with history-filled legends. I absolutely loved my tour of the beautiful Ravenna. Elisa was the ultimate professional. Her knowledge was quite extensive and her love for her hometown was evident. I saw stunning array of sites, one more beautiful than the next. The stories about Dante were so interesting! Thank you so much, Elisa, for a wonderful day. Really great tour. Would suggest it to anyone visiting Ravenna. Elisa the tour guide really knows her stuff. The mosaics themselves are amazing. We had a wonderful half day exploring the Byzantine mosaics of Ravenna with Elisa, our local tour guide. She met us at the train station, and it was a short walk to the first of 4-5 sites with well preserved mosaics. They were spectacularly well preserved, and Elisa did a great job explaining the history or Ravenna, the different periods when the mosaics were done, and the explanation of many of the Christian symbols that most of us do not understand today. Well worth the effort to get to Ravenna for this tour. It was what I wanted in Ravenna. We had a wonderful tour guide and Highly recommend her. The mosaics were beautiful and showed Christian ordinances from early Christianity that have been changed by man. This tour was truly eye-opening. Our guide,Elisa, was able to bring the multi-layered history of the art and architecture to life. She made its symbolic content clear to our untutored eyes, patiently explaining the larger meaning of these mosaic masterpieces. I will not soon forget this experience. An excellent tour conducted by a very well informed, native guide from Ravenna. We have travelled extensively and would recommend this tour to any others contemplating a visit to Ravenna. Guida molto simpatica e competente, che vi aiuterà a scoprire le meraviglie ed i mosaici di Ravenna. La città di Ravenna è veramente un gioiellino, da visitare assolutamente.